Ensure that your family is taken care of with estate planning, estate and trust adminstration services from the Law Office of Karen R. Spinardi in Merced, California. She also offers business law services. You can easily establish your limited liability company or corporation in California with help from Ms. Spinardi. A living trust enables you to transfer your estate to your children, extended family, or to whomever else you desire without a court proceeding. Young couples often set up testamentary trusts for minors. A power of attorney enables you to name an agent to manage your financial affairs during your lifetime when you are unable to do so. An advance healthcare directive enables a person you designate to make health care decisions on your behalf if you are unable to do so. Directives may include your individual decision regarding life support, organ donation, and funeral arrangements. 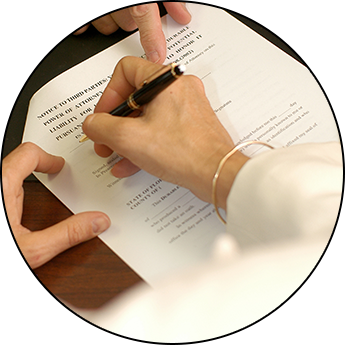 Probate is a court proceeding that occurs with or without a will to facilitate transfer of your estate to your legal heirs or beneficiaries. Ms. Spinardi will prepare the necessary petitions for the court, make court appearances, prepare the petition for distribution assist the executor/administrator through the probate process. A trustee of a trust is responsible for many duties to facilitate distribution of trust assets. Ms. Spinardi will assist the trustee in the trust administration process. If you're thinking of starting a business, Ms. Spinardi can help you establish a California Corporation, LLC in California, or California Partnership. She will prepare corporate minutes, answer business questions, and prepare buy or sell agreements to bring new shareholders into your company. Ms. Spinardi reviews contracts, real estate purchase agreements, and leases. She can thoroughly explain each document to you and suggest additions to ensure you are legally protected.